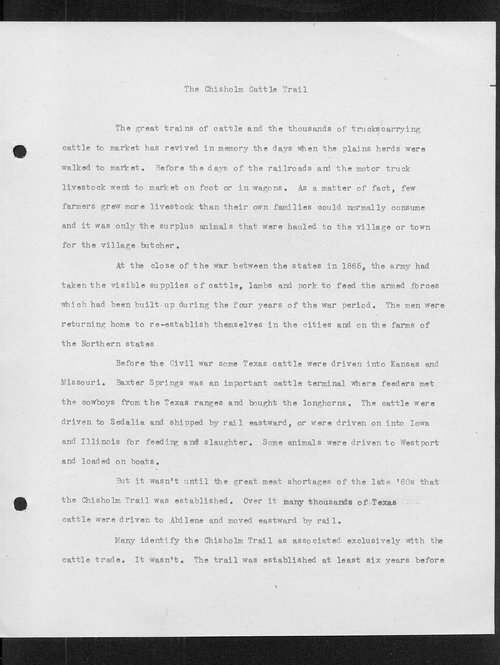 This item, written by Kansas City Star editor Charles Cecil Howes, concerns the Chisholm Trail, its origins, and its impact on Kansas. Howes explains that the Chisholm Trail was named after Jesse Chisholm who, along with James R. Mead, "freighted goods over the trail for years." According to Howes, Chisholm was a "half-breed Indian who engaged in the trading business for many years and established several trading posts in the Indian Territory [most of the land west of the Mississippi during that period]." Call Number: Charles Cecil Howes Coll. #393, Box 1, Folder: "Jayhawk Sketches"
People - Notable Kansans - Mead, James R.